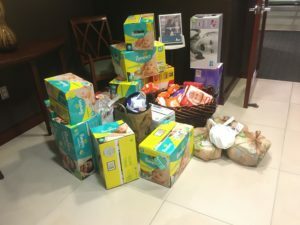 In honor of the three babies born to our employees this year, Pasternak & Fidis held a Diaper Drive to benefit the Greater DC Diaper Bank, whose main warehouse is located here in Montgomery County, Maryland. The Diaper Bank does fabulous work, not just supplying diapers and wipes, but so many items useful in the daily lives of people with young children. We gathered diapers, wipes, feminine hygiene products, baby pantry and nursing essentials, soap, shampoo, and even cash donations! Thank you to the generosity of our employees for improving the lives of at-risk families in our area.